Kahlee Leingang joined the SCUA team as a Processing Archivist on January 22, 2019. She is originally from the Chicago suburbs, but called North Carolina home for the past four years while she completed her graduate education. Kahlee earned a master’s degree in Library Science from the University of North Carolina-Chapel Hill and a master’s degree in Public History from North Carolina State University. In her free time, she enjoys reading, traveling, cooking, and visiting local museums. Rachael Acheson began work as the Assistant University Archivist in SCUA on January 8, 2018. Her work will center around documentation of student life at ISU, including the collection of current and historical records from student organizations and archiving University and student-run websites and social media pages with Archive-It. She will also assist with more general processing, outreach, and instruction. Rachael Acheson ((all photographs courtesy of Rachael Acheson). Rachael presenting a poster at the American Library Association Conference. In August 2016, Rachael earned her dual master’s degree in English (MA) and Library and Information Science (MLIS) from the University of South Carolina, where she concentrated on Archives and Special Collections, which allowed her to indulge both her fascination with rare books and textual studies along with discursive interests in transatlantic literature. While in her graduate program, Rachael taught freshman English courses and interned with the oral history and rare books departments. Rachael also had the opportunity to complete a number of amazing internships with the university libraries and local archives, including one that involved preparations to host a travelling exhibit from the Folger Shakespeare Library, which featured a First Folio. Immediately before coming to ISU, Rachael worked in Cedar Falls, IA, where she completed a 10-month temporary assignment as the Special Collections and University Archives Librarian at University of Northern Iowa. She is currently very much out-of-practice, but she plays the harp and began college as a Harp Performance major. Mary Foss, the principal harpist of the Des Moines Symphony Orchestra and also Adjunct Professor at ISU, Drake University, and Central College, was the first of her many excellent harp teachers. As a result, Rachael had the opportunity to attend an ISU masterclass with Catrin Finch, formerly the Royal Harpist to H.R.H. the Prince of Wales, when Rachael had been playing for only five months. After serving as the principle harpist for her college orchestra for four years, Rachael also performed briefly with the Central Iowa Symphony. She has a pewter-gray cat named Sterling, who enjoys standing on her head in the early hours of the morning and watching tv. She is a huge nerd about children’s and Young Adult (YA) literature, collects illustrated editions of Frances Hodgson Burnett novels, and has met Maggie Stiefvater twice. She spent a large portion of her childhood in Iowa Falls, Iowa, and so has some history of her own with Ames and likes to think she is in the process of getting better acquainted with the state as a whole. Rachael’s literary cat, Sterling, posing for the camera. She is excited to be back in the area. We’re excited too! Rosalie Gartner joined the SCUA team on November 15, 2017 as the Lead Processing Archivist. She moved here from Boston, Massachusetts, where she has lived for the past 6 years. Originally from Colorado, she moved to Boston to attend Simmons College, where she earned her MS in Library Science with a concentration in Archives Management. After graduation, she worked at Emerson College for several years, doing everything from course instruction to processing to records management. In her free time, she enjoys reading (of course), sewing, and traveling. Despite the extreme cold, Rosalie is happy to be here! And we are super ecstatic to have her here!! In light of National Poetry Month, Special Collections & University Archives (SCUA) staff are highlighting artifacts that inspire us. 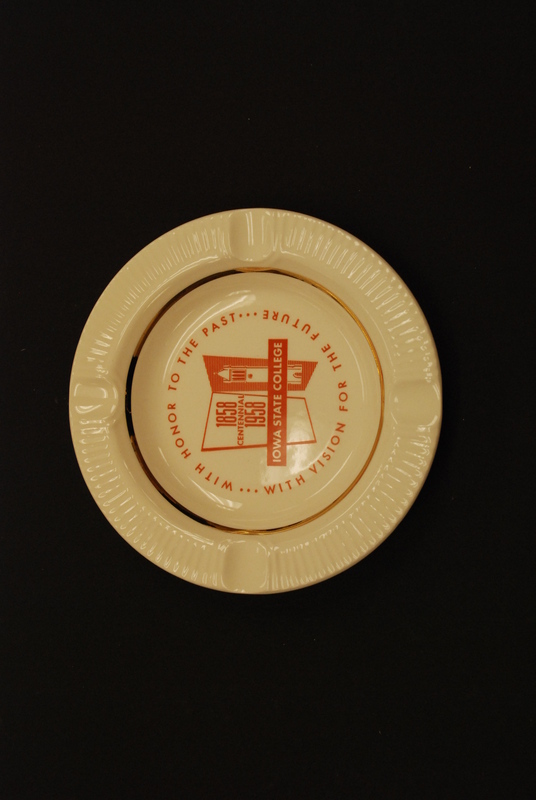 ISU Special Collections has seven or eight commemorative ashtrays. To my way of thinking, if you like the message about the school’s centennial, you wouldn’t want to cover it with ashes and cigarette butts, would you? That’s like lining a spittoon with the state flag. I find these artifacts inspirational because they remind me of how prevalent smoking used to be in the U.S. When I was a child — I was born in 1971 — people were allowed to smoke in more places than they are now. Not only was the smoke annoying (at best), but they littered the ground with countless cigarette butts. Even if you set aside the health effects, smokers made a major nuisance of themselves. My father smoked unfiltered “Camels” all day. I thought the packaging looked cool, but his habit was so unappealing that I never took it up. Thank goodness for that. We’ve come along way since then. I suppose there’s not much left of the commemorative ashtray industry. 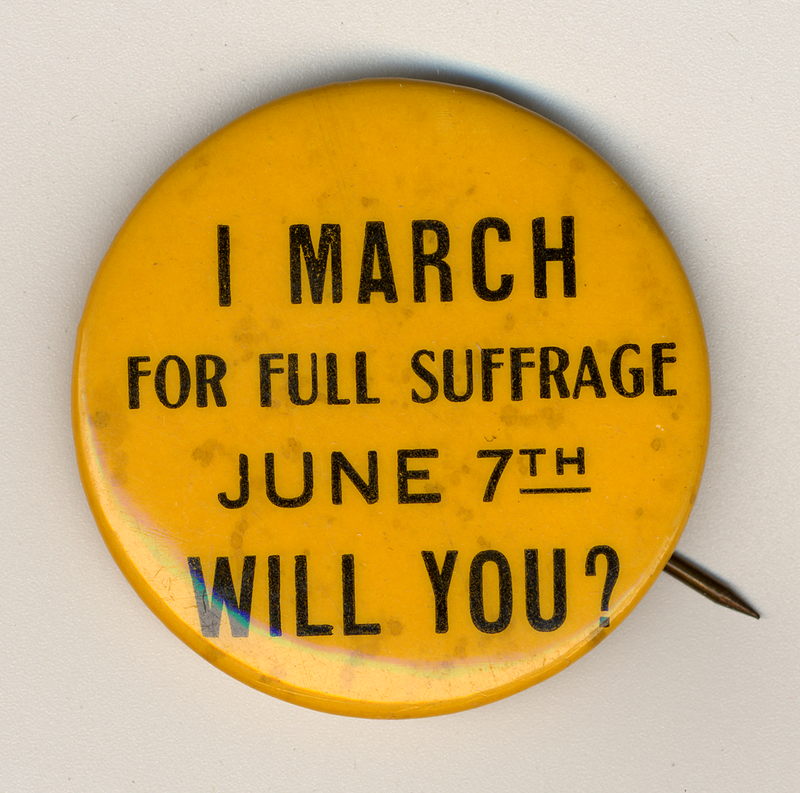 This button from our Artifact Collection inspires me because the work of first-wave feminists in securing women’s right to vote was so important in propelling forward the advances in women’s rights, a movement that has been carried on by so many generations of women since the late 19th century and continues today. I cannot imagine not being able to participate fully in the political system, or not being able to own property, to work whether married or single, and so many other rights that we tend to take for granted today. My grandma was born in 1922, two years after the ratification of the 19th Amendment. That helps put in perspective for me just how recently women have gained these rights. This button is from the Carrie Chapman Catt artifact collection, the well-known Iowa suffragist and Iowa State alum. Benjamin Gue was one of the authors of a bill to establish a state agricultural college and model farm (what would become Iowa State University). This artifact is inspiring because to me it represents the very purpose of the work we do in Special Collections and University Archives. Part of SCUA’s mission is to preserve the history of the University for future generations to access and learn from. 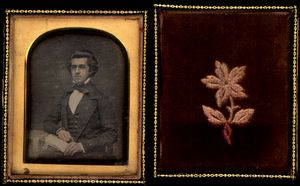 Daguerreotypes were among the first modes of “printing” photographic images and are susceptible to damage with too much light, or too high or low humidity and/or temperature. Providing stable conditions is an important part of our jobs. Another part is providing access to our collections. I think this artifact is a great example of a piece of history that might be lost entirely, or at least lost to the majority of researchers, if it were not for the work we do here. It blows my mind to see which books have been banned by governments around the world: https://en.wikipedia.org/wiki/List_of_books_banned_by_governments. Libraries and schools still ban books and many of them are classics and award-winning books. I am inspired by these “Read Banned Books” buttons because books inspire me. The stories within them and the way the authors have crafted their words to tell their stories make me feel connected to people, places, and ideas that are usually beyond my scope of experience. This month’s collaborative post highlights items from our Artifact Collection that remind us of spring. I know it’s probably a little premature to start thinking of spring, but tell that to this week’s forecast! Nothing says spring like baseball! That’s why I choose this metal baseball bat from our archives collection for this post. This bat is a special one. It has nine engravings that indicate which schools won this special trophy bat over the course of ten years. In chronological order: Grinnell 1892, IAC 1893, IAC 1894, SUI 1895, Grinnell 1896, Cornell 1898, Grinnell 1899, SUI 1900, SUI 1901, and Grinnell 1902. SUI stands for State University of Iowa, our rivals in Iowa City, and IAC stands for Iowa Agricultural College, the name for Iowa State University from its founding until 1959. The bat also includes an engraved baseball game scene surrounded by a leaf border. What a fun piece of history from early higher education in Iowa! Spring is all about getting back outdoors and enjoying the return of sunshine and warm weather. And for some people, that means going out to the ballpark and enjoying a friendly game of baseball. Iowa State no longer has a baseball team, but this silver bat traveling trophy, dating from the 1890s, is a reminder of the excellent Cyclone teams of years past. With major league pitchers and catchers reporting to Spring Training on February 14, my thoughts are with the coming season for my (reigning World Series Champions) Chicago Cubs. As a result, the Silver Bat is the artifact that makes me think most of spring. The bat was a trophy awarded to members of the Iowa Inter-Collegiate Base Ball Association. The Association, formed in 1892, originally included Drake University, Iowa College at Grinnell (now Grinnell College), Iowa Agricultural College (now Iowa State University), and the State University of Iowa (now University of Iowa). Cornell College joined in 1893. The bat has an engraving of a baseball game in progress and the following inscriptions: Grinnell 1902, SUI 1901, SUI 1900, Grinnell 1899, Cornell 1898, Grinnell 1892, Grinnell 1896, SUI 1895 on the handle; and on the end of the bat, IAC 1893, IAC 1894. 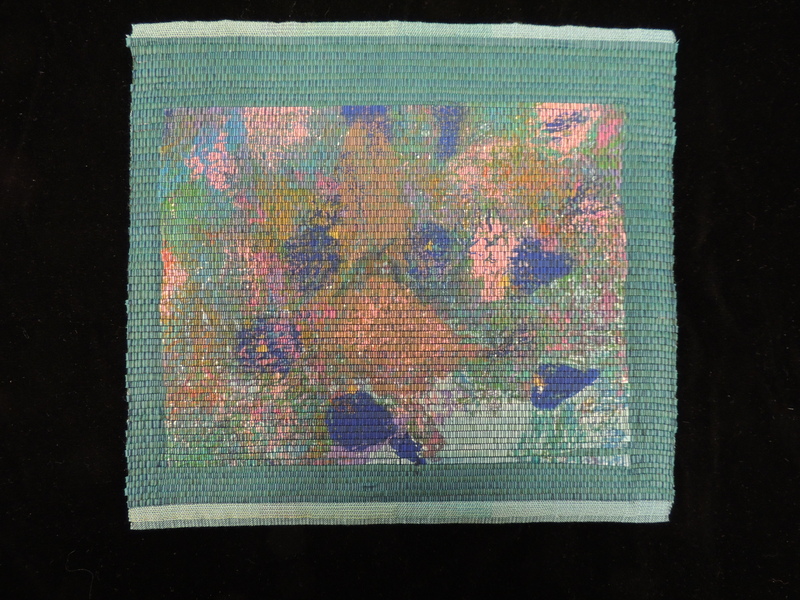 This woven picture by Shirley Held is entitled “Bluebirds Herald Spring.” To me, it strongly resembles an Impressionist painting. Monet could have put these colors together. This nearly-abstract scene truly sings of Spring. Shirley Held (1923-2014) earned a B.S. and M.S. in Home Economics and Applied Art at ISU before joining the faculty of the Department of Art and Design in 1953. She was promoted to full professor in 1975 and retired in 1990. ISU Special Collections and Archives has the Shirley E. Held Papers (RS 26/2/53) in addition to dozens of textile artworks like this one. I’m making a mental note to learn a bit more about Held, her career, and her artistry. One of our artifacts which definitely makes me think of spring is the lithographic plate (Artifact 2000-105.002) of a bird’s nest with eggs, and then right next to it the hatched baby birds. I also love that not only do we have the original plate, but also one of the prints which was made from the plate (2000-105.001). Lithographic plates have always intrigued me since I first learned about them – who would have ever thought to create a print from stone and a water-resistant drawing substance such as wax? This artifact comes from Iowa State University’s Iowa Cooperative Fish and Wildlife Research Unit Records (RS 9/10/04). This button reminds me of spring for a couple of reasons. VEISHEA, of course, was celebrated in the spring. This button invokes memories of the parade, cherry pies, and dirt dessert from the Agronomy department. 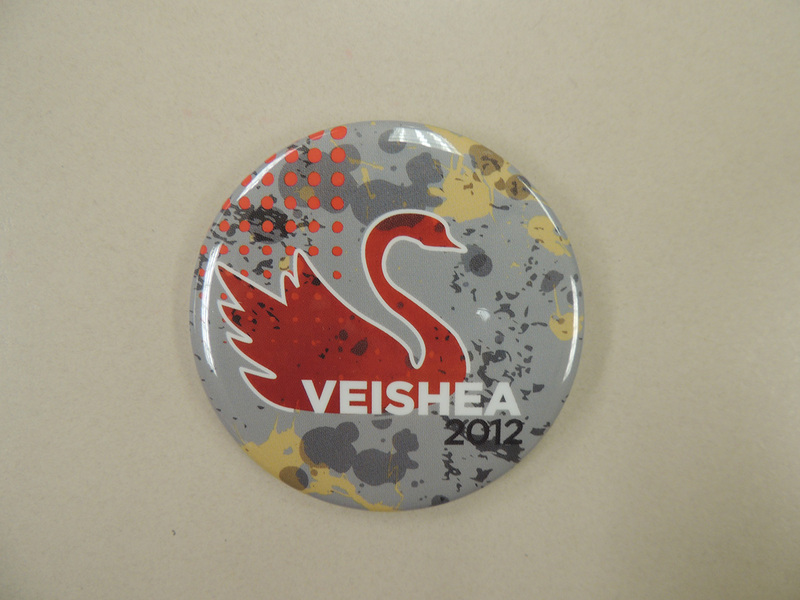 While there are many VEISHEA artifacts, photographs, and documents in the archives, I chose this button because of the depiction of one of ISU’s swans. Spring is a great time to walk around our beautiful campus; and specifically, take a break by Lake LaVerne to visit Lancelot and Elaine. To learn more about VEISHEA, see our online exhibit or by visiting the archives to look at RS 22/12: VEISHEA. This hand fan was presented to Martin Jischke, Iowa State University’s 13th president, in May 1993. The hand fan includes birds and butterflies. It makes me think of spring because of the artwork on the fan. Of course, a fan also comes in handy as the temperatures heat up in spring.” This fan is associated with the Martin C. Jischke Papers (RS 2/13).